Ghost emerges on the West Coast and somehow finds itself out of a 24:00 minute Rock and Roll. To say I was excited is an understatement. The segue and all of Limb by Limb has been included. After a monster Rock and Roll, there is a quick pause before Trey leads the band into Ghost. It doesn’t take long for the band to join in. Things are bit more punchy then normal and quickly move into the vocals. There is almost no intro jam. The solo section has some twang form Trey and is more of a full band jam than normal. Mike’s drop in throws things a bit as it is a bit disjointed. Not my favorite. The lead in nicely done once again, glad that seems to be a non issue. The length of the pause is about average and gets a nice jolt on the drop in. Well done fellas! Tons of energy! A very short composed section… More time for the jam! Trey holds some notes while Fish drops a bunch of fills to start this jam. Mike and Page start to get funky and the mood begins to go that direction. Things drop at the 3:51 mark and Trey twangs out a note. Then he plays a funk lick at 4:06 and the crowd goes nuts. DA FUNK is here and smoking. Warning I am couple beers deep tonight and pumped to write this. This may go type 2. Anyways, when the funk drops I am a dancing fool. No time to waste. Phish is getting this Ghost jam off to a flying start. At 4:19, Mike digs in with the power bass and just sinks his teeth into this jam. He lays the foundation down and then builds a fortress of funk with it. Bring it Mike! Trey plays around Mike’s massive space. Page works in a clav attack that is on the softer side, allowing Mike’s big bass to shine. Fish has a cool rhythm working that allows all of the creativity to take place. We are locked in folks. Clear some room, you need to get up and move. At 5:25, Trey starts to hold things up a bit, to see where the band takes him. Page opts for some heavenly melodies. What results is everyone trying to steer things a different direction for a couple measures. Things get a bit disjointed, but quickly fall back into place. Fish drives through and gets things back on the path. At 5:58, he speeds things up and gets this jam moving. Mike works right on top and then Trey and Page fall in line. Things are moving beautifully, with Mike as the big star for me. Mike’s bass sounds like a cross between traveling through Jupiter’s core and swinging on a hammock in my backyard. The f’d up part? I don’t own a hammock. Yeah, his sound is that cool. Trey starts to repeat a high pitched lick and things begin to move toward a beautiful place. All four band members build a blissful tension that is so organic. Nothing seems forced and this flows upward wonderfully. At 7:43, Trey comes away from that lick and begins to solo us into the clouds. It is perfectly patient and the beauty doesn’t rush. Page chooses the perfect time to move to the piano at 8:15. When he finds the grand piano, this just goes to an entire new level. Page, we’re not worthy! The band is in complete control and locked in. Holy Ghost get ready, Long Beach is heading towards you. With incredible balance from the entire band, this begins to move my soul. 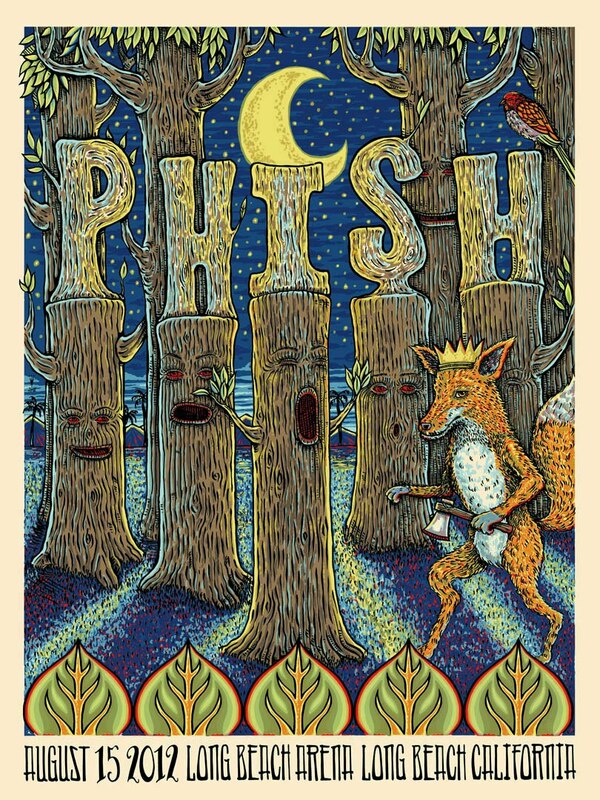 Mike and Fish are integral parts of this bliss, but it is Trey and Page who steal the show. Working together like John Holmes and Jenna Jameson, they are in complete unison. Much like the Boogie On Reggae Woman at DCU, this is the payoff to the previous jam. At DCU, it was the big exploring Ghost that gets paid off by the Boogie On Reggae Woman. Here in Long Beach it is the Ghost that pays off the massive Rock and Roll. These peaks are even more awesome when you explore the ends of space before getting there. By the 10:15 mark, Trey has found himself perfection. His tone and pacing is gorgeous. If this doesn’t make you happy, not much is going to. This is the stuff that, when you first get to heaven, is playing in the background. This is that first sip of coffee in the morning. This is leaving work on a Friday. This is the ending to Shawshank Redemption. Just when I didn’t think Trey couldn’t play any better he rips a solo at 11:08. If you doubt Big Red still has it, I implore you to re-listen to Trey during this section. He is breathtaking. A Dirt tease… Then Roggae!!!! A dark evil Roggae jam/quotes from Fish breaks out. This is awesome. Then Trey turns things towards Limb by Limb. I’m not quite sure that the rest of the band wanted to go there. Things stop for a second as Trey forces Limb by Limb. Interesting outro! And yet again another unique 2012 Ghost. You missed the peaks in 2012? Here you go! The ending to this Ghost is beautiful after a cool funk opening jam. Standout version, and a big payoff to the monster Rock and Roll before it. very nice run. thanks. Wondering how you can include the timer in the screen as we scroll down. As you describe the changes, (ever so well), it’s tough to scroll back up, to check the time on the streaming tunes. I realize this is a techical first world problem, but if it can be figured out, I would be grateful…. also, awesome Ghost. Helmet worthy.